Ken Research announced its latest publication on "India Herbal Extract Market by End Users (Pharmaceuticals & Nutraceutical, Cosmetics and Food & Beverage Industries), by Extract type (Carotenoids, Aloe Vera, Ginger, Capsicum, Turmeric, Shilajit, Marigold, Shatavari and Others), Oleoresins and Essential Oil – Outlook to 2022" suggested a rapid growth in India Herbal Extracts Market, majorly driven by the growing preference of people for natural and herbal products over the already existing chemical-based products. The stakeholders of this report include herbal extracts, oleoresins and essential oil manufacturers and distributing agents, pharmaceutical & nutraceutical, cosmetics, and food and beverages companies, companies involved in research, farmers in India and the new entrants and venture capitalists who wish to invest in herbal extracts market in future. Detailed comparative analysis of major herbal extracts market players has also been provided. Various marketing analysis factors such as trends and developments and SWOT analysis are also added in the study. The future analysis of the overall India herbal extracts market has also been discussed along with recommendations from analyst view. Plant or herbal extracts are natural products which have gained immense importance over the past few years. Such products are used as raw materials or ingredients by the companies operating in pharmaceuticals, cosmetics, and food and beverages industries across the world. Asia Pacific is amongst the fastest growing geographies owing to the demand and supply of herbal extracts from China and India. India herbal extracts market has recorded phenomenal growth over the years with rising awareness among the people about the health benefits of consuming herbal products. Herbal extract market in India increased to INR ~ crore in FY'2017 from INR ~ crore in FY'2012, at a robust CAGR of ~% during the same period. The market has majorly been driven by the exports of high quality herbal extracts which are demanded by the US, Canada, Ukraine, South Korea, Czech Republic, Israel, France, Taiwan, Nepal, and other nations. The inclination of foreign customers towards Indian products due to health benefits of various herbs has led to a boost in the revenues of the market. By End Users (Pharmaceuticals and Nutraceuticals, Cosmetics, and Food & Beverages Industries): The use of herbal extracts in the pharmaceutical and nutraceutical industry of India contributed a dominant share of INR ~ crore in the overall sales of the players operating in the space during FY'2017. The rising demand for natural cosmetics has resulted in augmented use of herbal extracts in preparing beauty products. The sales of herbal extracts to cosmetics companies in India contributed INR ~ crore to the overall revenues of the market during FY'2017. The overall sales of herbal extracts to companies in food & beverages sector accounted for INR ~ crore of the total revenues during FY'2017. By Export Sales and Domestic Sales: Export sales dominated the market and contributed INR ~ crore to the overall sales of herbal extracts by all the players operating in the space. Domestic sales of herbal extracts contributed INR ~ crore to the overall revenues within the country during FY'2017. Segmentation by Major Herbal Extracts: The sales of carotenoids by Indian manufacturers to pharmaceutical and nutraceutical companies dominated the market, by contributing ~% to the overall revenues during FY'2017. Aloe vera is also known as the medicinal aloe and has several benefits to human skin and health. The total sales of aloe vera extract to pharmaceutical and nutraceutical sector contributed ~% to the overall sales during FY'2017. The overall sales of ginger extract accounted for INR ~ crore of the revenues generated by herbal extract manufacturers from their sales to pharmaceutical and nutraceutical customers during FY'2017. Herbal extract manufacturers added ~% and ~% to the overall revenues generated from the sales of marigold and shatavari extracts respectively, to pharmaceutical and nutraceutical customers during FY'2017. Segmentation by Application: Drugs for general wellness accounted for the maximum consumption during FY'2017, wherein herbal extract manufacturers generated ~% of the total revenue from sales of extracts used in such medicines and supplements. Herbal extracts for improving the conditions of digestive system and liver accounted for ~% of the overall sales during FY'2017. The overall consumption of herbal extracts for curing cardio vascular diseases resulted in ~% of the overall sales to pharmaceutical companies during FY'2017. Segmentation by Herbs: Turmeric is the most used natural ingredient in manufacturing cosmetics products and contributed a dominant share of ~% to the overall market revenues during FY'2017. The total sales of aloe vera extract to the cosmetics industry in FY'2017 contributed a share of INR ~ crore to the market revenues. The overall sales of brahmi and amla extracts to the companies in cosmetics industries constituted a share of ~% in the overall market revenues during FY'2017. The rising demand for bathing bars, facial bars and facewashes with herbal ingredients made kesar and chandan extract account for INR ~ crore in the overall market revenues during FY'2017. The use of coffee extract in various skin care and hair care products resulted in this segment contribute ~% to the overall revenues from sales of various types of herbs used for extraction by cosmetics industry during FY'2017. Segmentation by Major Herbs: The revenues generated from sales of extract derived from amla dominated the Food and Beverages herbal extracts market, contributing ~% of the overall revenues during FY'2017. The sales of aloe vera extracts constituted for INR ~ crore in the overall revenues from sales of herbal extracts to companies operating in food and beverages industry in the country during FY'2017. The growing sales of bitter gourd juices have added to the sales of the extracts from the herb, contributing ~% to the overall market revenues during FY'2017. The total sales of extract produced from jamun constituted INR ~ crore in the overall sales by the market players to F&B sector in the country during FY'2017. The sales of ginger and turmeric extract to food and beverages companies accounted for ~% and ~% respectively of the overall sales during FY'2017. The sales of boswellia accounted for ~% of the overall revenues generated by the herbal extracts manufacturers from their sales to food and beverages customers during FY'2017. Oleoresins are pure extracts of spices or herbs. Kancor Ingredients was the first market player in India manufacturing oleoresin of black pepper, followed by Synthite Industries Limited and Plant Lipids. Other leading market players include Arjuna Natural Extracts Ltd., and Sami Labs Limited. As per several industry reports, India held over ~% in the global oleoresins production in FY'2017. India oleoresins market increased from INR ~ crore during FY'2012 to INR ~ crore during FY'2017, at a CAGR of ~% during the same period. The market for oleoresins has been increasing due to rising demand for packaged spices and the use of spice mixes in food applications. The allowance of ~% foreign direct investment (FDI) in five plantation crops, which include cardamom via the automatic route has attracted foreign fund in cardamom plantation, thus having a positive effect on the extraction volumes of oleoresins. Major Herbs Used to Extract Oleoresins: The most used herbs for oleoresins extraction are turmeric, black pepper, paprika, capsicum, ginger, garlic, and onion. In terms of volume, oleoresins from paprika had the largest contribution in the market, whereas, in terms of value, oleoresin from turmeric led the overall revenues during FY'2017. India Oleoresins Market Future Outlook and Projections: The market for oleoresins in India is expected to incline from INR ~ crore during FY'2017 to INR ~ crore during FY'2022, at a CAGR of ~% during the same period. Asia Pacific is projected to drive the growth of the market owing to the development of food processing industry in the developing nations including India, China and Indonesia. The overall market is concentrated among the top seven players which hold the majority of the share. Major players in the herbal extracts market in the country include Arjuna Natural Extracts Ltd., Synthite Industries Limited, Sami Labs Limited, Vidya Herbs Private Limited, OmniActive Health Technologies Ltd., Indfrag Limited and K.Patel Phyto Extractions Pvt. Ltd.
Synthite Industries dominated the market revenues in India Herbal Extracts Market, contributing INR ~ crore during FY'2017. Plant Lipids Pvt Limited acquired the second position in terms of market revenues, majorly driven by its manufacturing facilities in India. The company had ~% share in the market revenues during FY'2017. Sami Labs Ltd is the third largest herbal extract player in India. OmniActive Health Technologies Ltd. constituted a share of ~% in India herbal extracts market during FY'2017. Arjuna Natural Extracts Ltd. had a share of INR ~ crore in the overall revenues generated by all herbal extracts market players in India during FY'2017. Indfrag Limited acquired a share of ~% in the overall revenues generated by India herbal extracts market during FY'2017 and Vidya Herbs Private Limited accounted for INR ~ crore of the market revenues during the same year. Catering to the leading pharmaceutical companies in the country through its product portfolio of herbal extracts, K.Patel Phyto Extractions Pvt. Ltd. had a share of ~ in the overall market revenues during FY'2017. 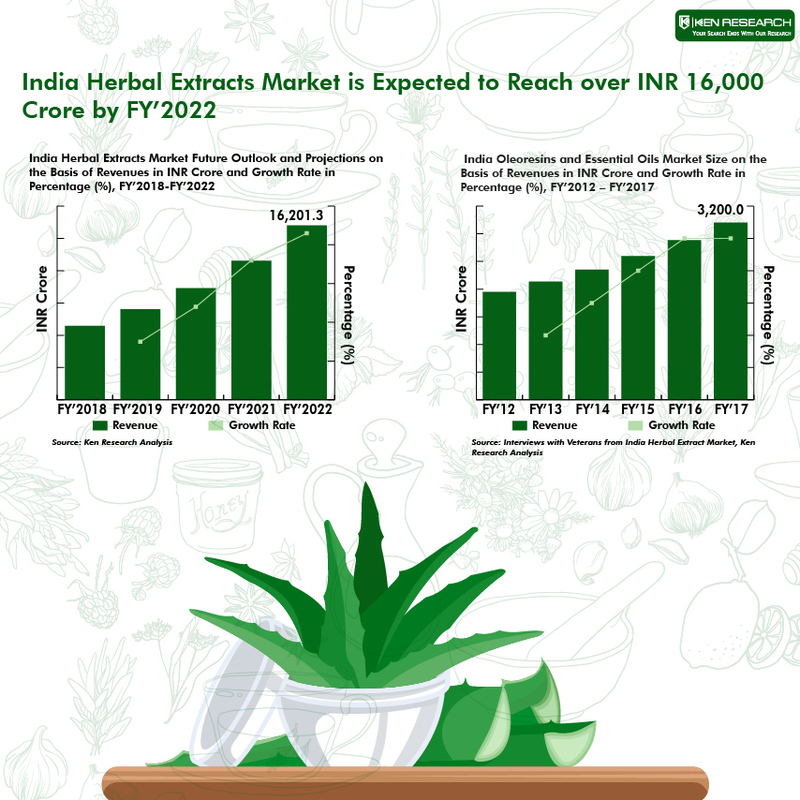 The revenues generated by herbal extracts market players in India are projected to augment to INR ~ crore by FY'2022 from INR ~ crore during FY'2017, registering a CAGR of ~ during the period FY'2017-FY'2022. The sales of herbal extracts to pharmaceuticals and nutraceutical industry in the country are projected to dominate the market with a share of ~% in the overall market revenues during FY'2022. The shift of people from packaged food with high chemical content to dietary supplements with herbal extracts will make F&B customers contribute INR ~ crore to the overall market revenues during FY'2022. 18.5. OmniActive Health Technologies Ltd.
18.6. Arjuna Natural Extracts Ltd.
Table 18-21: Product Portfolio of Arjuna Natural Extracts Ltd.
Synthite Industries Limited, Plant Lipids Private Limited, Sami Labs Limited, Kancor Ingredients, OmniActive Health Technologies Ltd., Arjuna Natural Extracts Ltd., Indfrag Limited, Vidya Herbs Private Limited, K.Patel Phyto Extractions Pvt. Ltd., Sydler India, Alpspure Lifesciences Private Limited, Cymbio Pharma Pvt. Ltd., Sai Phytoceuticals Pvt. Ltd., Sanat Products Ltd.